An hour’s drive from Tbilisi lies a minefield, the largest remaining in Georgia. 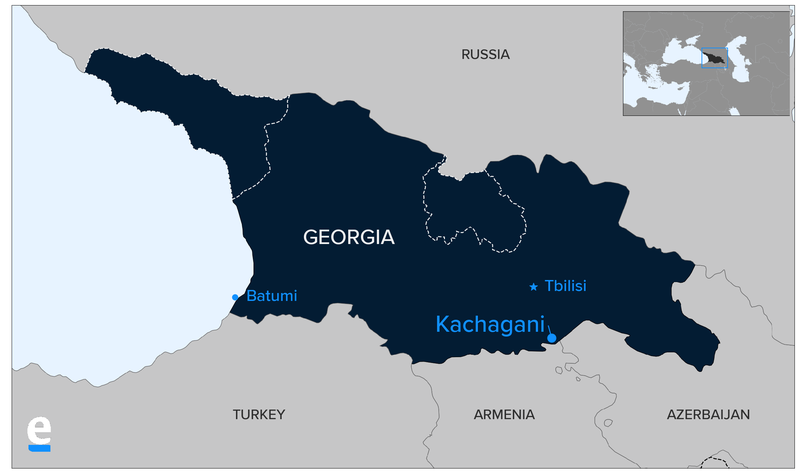 For more than 25 years, this part of Georgia has been effectively controlled by Azerbaijan’s armed forces. Azerbaijani forces laid the minefield at the height of Azerbaijan’s war with neighboring Armenia over the disputed territory of Nagorno-Karabakh. At the time, Georgia was a dysfunctional state, with loosely aligned paramilitary groups controlling large parts of the country. Not only does Azerbaijan keep mines in the region, it sometimes sends soldiers across the border to inspect them, JAM News reported earlier this year, citing an unnamed former official from Georgia’s Ministry of Defense. The mines are also volatile. According to employees in the school, a fire in January 2018 triggered nearly 28 mines. Nobody was injured, but that doesn’t prevent local people – a majority of whom are ethnic Azerbaijanis – from pointing fingers at Azerbaijan’s foe, Armenia. The local government is ill-positioned to offer support. Ekhmidzhian Aliyev, Kachagani’s mayor, sits in a crumbling office with poor lighting and a leaking ceiling. According to Aliyev, the mines also pose a threat to local farmers’ livelihoods. More than 60 accidents involving livestock in the minefield have been reported to his office. According to witnesses and the briefing, which has been seen by Eurasianet, as HALO Trust employees approached the minefield about 50 meters from the border, Azerbaijani soldiers mobilized tanks and heavy artillery. The Azerbaijanis demanded HALO Trust leave the area, even though the group was accompanied by officials from Georgia’s Foreign Ministry and border police. Azerbaijan denies the accusations: They “do not reflect the truth,” said Hajiyev, the Foreign Ministry spokesman. Due to funding cycles, HALO will have to exit Georgia at the end of 2018 if permission is not granted to clear the area, Irakli Chitanava, the organization’s program manager, told Eurasianet. After HALO has left, the cost of reopening the program would be prohibitive to donors, the organization argues. This isn’t the only border dispute Georgia has with its neighbor and ally. As with the area abutting Red Bridge, Azerbaijan deems the area around the monastery to be of military significance due to its position on a hilltop, a “strategic height.” The total area, including nearby ancient caves, is about 25 square kilometers. Georgia is increasingly dependent on Azerbaijan for energy (Azerbaijan accounts for 90 percent of Georgia’s natural gas supplies). Some government critics have taken to dubbing Georgia “Socartvelo” – a portmanteau combining the name of Azerbaijan’s state oil company, SOCAR, with the Georgian-language word for the country, Sakartvelo.